Mother’s Day is May 12th ~ order her gift set today! These seasonings have been created for Arizonans because we can barbecue year ‘round but perfect for all backyard pros! 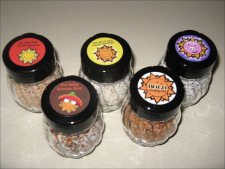 STEAK SEASONING: Designed specifically for beef but our customers love it on salmon, red snapper, fresh tuna…popcorn, eggs, and potatoes. The rich blend of sea salt, black pepper, garlic, and onion makes this our “All Purpose Seasoning”. CHICKEN SEASONING: While a delicacy on any poultry dish, the addition of orange and lemon peel brings out the Southwestern flair of great grilled chicken. Customers tell us that because of the citrus, it is delicious on white fish like cod, halibut, and trout! PORK RUB: This seasoning was designed with the assistance of our friends from Hawaii. Who better knows how to grill, bbq, or roast pork? The secret to the success of this Pork Rub is the addition of rosemary, celery seed, parsley, and onion powder. This special blend is designed as a “rub” because when sprinkled generously, it actually melts, coats and flavors the meat. To be used on pork roasts, including pork loins, pork chops, and carnitas! MEXICAN SEASONING: All the stops were taken out for this special blend. With the assistance of a team of cooks, chefs, and fishermen from Guaymas Sonora, Mexico, and a lot of input from our Mexican/Latino friends here in Oro Valley, Arizona, this blend of seasonings will amaze you! Again, using our basic ingredients of coarse sea salt, ground pepper, garlic, and onion powder we’ve added cumin, coriander, ground celery, cilantro and our secret blend of 7 or more ground chili peppers! Not as spicy hot as dishes from Chihuahua, but plenty of flavor with a tad of a bite at the end. If you’re from Montana or Wisconsin you’ll say “ooh”! If you’re from the Southwest or Mexico, you’ll say “ahhh”! Use on all Mexican dishes, salads, vegetables, soups and whatever your heart desires. Our kids love it on veggies. BOLD SEASONING: We could not come up with a better name than “BOLD” as that describes it perfectly. Rich with chile peppers, fine salt, powdered garlic, ground black pepper and onion, dehydrated lemon, a tiny bit of sugar, turmeric and paprika. This perfect balance of ingredients will be everyone’s favorite on your grilled, fried and baked entrees. INTENSE! CAJUN SEASONING: Award Winning Cajun Seasoning is chosen by The Pride Louisiana Division of The Cajun Navy. The Cajun Navy is a dedicated group of citizens who have saved hundreds of people during recent disasters/hurricanes by putting their own lives on the line. We are proud to be a part of this important endeavor. You simply must try Oro Valley Gold®.